Fragile labels tell shippers that they should handle the package with care. The package contains delicate instruments that are fragile. • Your package contains fragile equipment. 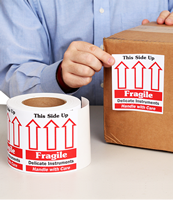 Fragile labels help prevent rough handling.